When your superpower is running extremely fast, you should stick to solid ground-- concrete, turf, asphalt, the Bonneville Salt Flats. Sure, several members of the Flash family have run across the surface of various bodies of water. I assume. That certainly seems like something they would do, doesn't it? Therefore, they must have done it in some comic past. Even so, you need a running start to build up enough speed. And you need that speed to avoid caimans. They like nothing better than to clamp down on the leg of a brightly-attired teen superhero and drag him or her down into the water, then go into a death roll until their prey drowns and they can devour it at their leisure. 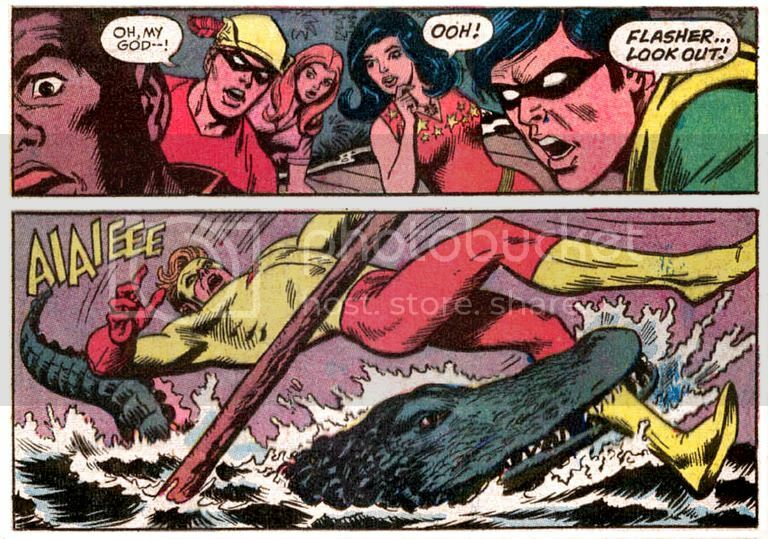 That's what happens to Kid Flash, when just moments before he was hanging from one of the poles he was using to push the raft along. Kind of funny... before it turned into a scene from one of those Faces of Death videos. But hey, guess what. This isn't the weirdest thing that happens in Teen Titans #42, "Slaves of the Emperor Bug" (1972). It seems TV shows about "picking," pawn shops and buying the contents of storage garages are all the rage these days. Those and programs about groups of jerks who work together in small businesses making things, tattooing each other and generally clowning around. Well, this isn't a recent phenomenon by any means because Wonder Girl was way into yard sales and flea markets before you were even born. In this story, Kid Flash tries to buy her a beetle-shaped brooch, but he's outbid by some nut named Johnny Carpetbag. Johnny's a local eccentric whose generosity is second only to his body odor in vastness. He gives the brooch to Wonder Girl and later that night, the jewelry starts talking to her and offering her visions of a golden-hued warrior in battle with a giant salamander. The brooch demands Wonder Girl return it to its rightful place, which turns out to be a skull-shaped temple deep in the jungles of the Yucatan. The whole groovy gang heads down a river in a large raft. Kid Flash gets mauled by the caiman, Wonder Girl fights a jaguar and then a poisonous snake and our old pal Johnny Carpetbag arrives and turns out to be the minion of a giant beetle that wants to eat the Titans, but has "other plans" for Wonder Girl, who he asks to embrace him as his "warrior girl." Yeah, we're going to have to talk about this one in greater detail sometime soon. "Flasher" has to be one of the more unfortunate superhero nicknames.